“Yeah, I’m just going surfing this weekend,” I said nonchalantly to my colleague, hoping to subtly insinuate that not only do I surf all the time, but that I’m really good at it. I could see the wheels spinning; “Do you surf a lot,” he asked skeptically, eyeing the large chocolate muffin in my hand. I nodded my head in a way that could have been interpreted as a yes, but could also be played off as an involuntary twitch if pressed further on the subject. “Nice one, well have a great trip,” he said, and walked away thinking Kelly Slater when, from a surfing standpoint, Kelly Clarkson was probably closer to the truth. 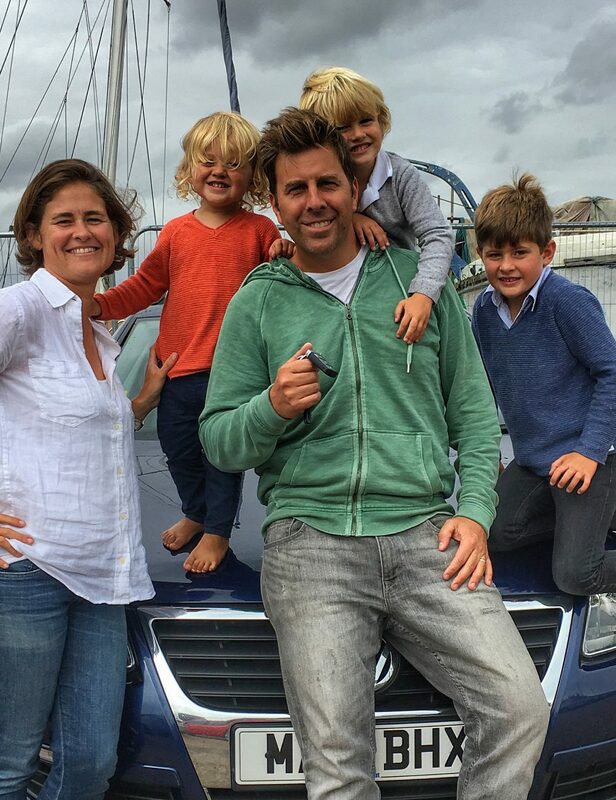 I was off for a surf weekend though – a road trip to Cornwall with my oldest son Harry and my friend Mark and his two sons. This was going to be the highlight of early Autumn; a boys’ weekend…a couple of days surfing, a little sunshine and a few beers on the beach. I couldn’t wait! Sadly my enthusiasm for surfing is only distantly related (3rd cousins) to my ability to actually surf, having started less than three years ago. However, I felt no need to advertise that minor fact, preferring instead to have my friends and colleagues greatly overestimate my athletic prowess. The two dads were in the front (with Mark generously offering to drive), two boys in the back and one in the way back. Still three kids in the car as per our usual family road trips, but two of them were not mine and all of them were over the age of 7. Jackpot! Absent was the endless teasing, the glass-shattering shrieks, the tears, the dirty nappies and the fighting over what to watch on the iPad and who gets to hold it. This drive, compared to our usual road trips, was like the difference between a hot oil massage on a beach in the Maldives and getting hit directly in the nuts by a Lionel Messi free kick from 10 yards out. Having experienced neither of these things, this comparison is a bit speculative, however my point (if you’ve missed it) is that the latter is significantly less preferable…I guess unless you’re a huge Messi fan or are contemplating cheaper vasectomy alternatives. The drive flew by. All six and a half hours of it (“you know I’ve done this drive in 4.5 hours once?“… “yeah me too.“). Catherine called me en route and asked if I was critiquing Mark’s driving. No. Was I yelling at him when he took a wrong turn. No. Was I telling him to speed up? slow down? change lanes? No, no and no. “Well, I’m glad that you are controlling yourself,” said Catherine, in a very not glad tone. “Or maybe Mark is just a better driver than you,” I didn’t say out loud. The thought of a nice cold Cornish brew got us through the last hour of the drive and at 7:15pm we pulled into the parking lot of the Cornish Arms in St Merryn. While the kids ran around outside, we made a beeline to the bar, grabbed some drinks and caught the last few minutes of light while sipping our beers in the garden, a world away from London. Saturday morning: we were all up early and ready to hit the waves, despite the cloudy skies. But first we had to get kitted out in our wetsuits. Getting on Harry’s wetsuit is never fun. I would describe it simply as the opposite of fun. There is a lot of lifting and pulling, whining and accusations of intentional pinching, until the process is complete and we are both left mentally and physically drained. But getting on Harry’s wetsuit is relatively enjoyable compared to getting on my own wetsuit (think OJ and the glove). I find it hard to squeeze into skinny straight leg jeans without injuring myself, so imagine (well, maybe not if you’re eating) the difficulty I experience when trying to put on a skin tight body suit. In ten minutes I had sweated out two kilos of water weight and was ready for a nap, not for surfing…and I’d only gotten the right leg on. “Seems like my wetsuit shrunk,” I muttered as Mark came over to help me. Did he just pinch me on purpose? Wetsuits on, we walked down to the beach where we were all taking a surf lesson at the Harlyn Surf School. We met our two instructors, who looked like they probably didn’t have any trouble getting on their wetsuits that morning (or ever), and after a little stretching and a few safety tips, we were in the water. The instructors were encouraging, giving out advice like “bend your knees” and “you’re too far forward on the board“, but I knew they were silently thinking “maybe skip dessert once in awhile” and “go for a run“, while promising themselves that they would never let their twenty-something bodies deteriorate to my physical condition. When the lesson was over, I summoned my last bit of strength to carry the surfboard back to the surf school, a significant distance given that the tide had gone out. Despite being physically crushed, I did feel pretty confident in my wetsuit with my belly sucked in and the surfboard tucked snugly under my arm like in the movies. I walked up the beach feeling like a pro, vaguely aware that my wetsuit made me look like the illegitimate son of the Michelin man and a sea lion, but pushing that realization to the far reaches of my subconscious where it was replaced with visions of Johnny Utah. And I was definitely getting some looks from the ladies…the fact that they were all over 65 didn’t make me feel less special. With morning surfing over, we headed into Padstow for lunch. We decided on Rick Stein’s fish and chip restaurant because, well Rick Stein. For those who don’t know him, he is an English celebrity chef (no, not Jamie Oliver…no, not Gordon Ramsey either…fine, just google him) who dominates Padstow with his restaurants, cafe, store and cooking school. It’s hard not to admire the guy…he has his name on everything including wine, beer, sea salt, cheese and plates. Some people judge success by wealth or power, however I’ll know that I’ve made it when my signature is boldly etched into savoury oat biscuits. Mark and I motivated to surf in the afternoon, possibly refreshed by a “light and healthy” meal of fish, chips and mayo and the promises of slipping on the cold, damp wetsuits waiting back for us at the house. After another two plus hour surf session in the water, I resigned myself to the fact that I might be sleeping in my wetsuit, potentially on the beach, in lieu of the five minute walk to the house I was convinced I simply could not make. Bedtime (which was 8:30pm for kids and adults) could not have come sooner. We managed one last surf session on Sunday morning, having been energised by a breakfast consisting of the ubiquitous Cornish pasties bought at Chough Bakery in Padstow, a store that, over the years, is partly responsible for the difficulties I experience in getting on my wetsuit. Showered and packed, with four bags of unused provisions in the back seat, we made our way to London. I arrived home completely spent, but still considerate enough to ask my lovely wife how her “weekend off” was. “Surfing is exhausting,” I said as crawled into bed…still wearing my wetsuit. Always enjoyable to read about your “Driving Dad” travels. Witty and wryly written, there is much charm in every paragraph. Of course, the pictures of your adorable children, lovely destinations, and fine food only add to the vicarious adventure. Cheers!